Heavy alcohol consumption over a long period of time has an effect on your entire body. Although you can’t see the damage it does internally, every organ is affected by alcohol abuse. Chronic heavy drinking poses many health risks, both short and long-term, to the alcoholic. Drinking excessively immediately increases the risk of many short-term health problems. The one that most people think of first is injuries that occur in motor vehicle accidents, but injuries can also occur from falls, burns, and drownings. Heavy drinking over time can lead to many serious health problems, including organ damage and chronic diseases. Alcohol is a central nervous system (CNS) depressant. It changes the way the brain works by altering the way its neurotransmitters and receptors respond. It affects a person’s emotions, moods, and reactions. Cognitive functions are affected, making it difficult to solve simple problems or process information. Heavy drinkers are more at risk for developing cardiomyopathy, a disease of the heart muscle. When a person has this disease, their heart muscle becomes abnormally enlarged and thickened—making it harder to pump blood in its weakened condition. This disease often results in heart failure. People who drink heavily over a long period of time have a higher risk of contracting infectious diseases because their immune system is weakened. Their suppressed immune system makes them more vulnerable to many types of infections, including pneumonia, tuberculosis, HIV/AIDS, and other diseases that are sexually transmitted. The reproductive system of both men and women is affected by heavy drinking. Men who are heavy drinkers are more likely to have erectile dysfunction. Women who drink heavily may cause their menstrual cycles to stop, which results in infertility. Women who do become pregnant have a higher chance of miscarriage, early labor, or stillbirth. Bone health is affected by heavy drinking, especially in teenagers and young adults. It increases their chance of developing osteoporosis in their later years. This disease causes loss of bone mass and increases the chance of fractures, especially to the vertebra or hip. Addiction to alcohol can also result in muscle cramps, muscle weakness, or atrophy of the muscles. Alcohol has a very damaging effect on the gastrointestinal tract. 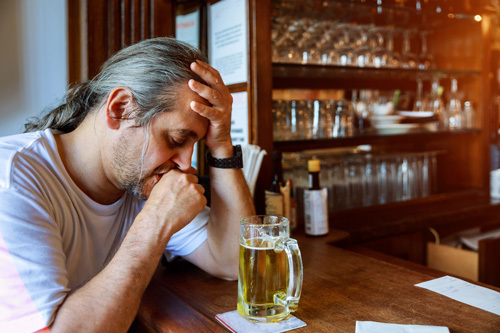 The effects of long-term heavy drinking on the digestive system include stomach ulcers, heartburn, acid reflux, and gastritis (inflammation of the stomach lining). Veins in the esophagus can become enlarged and cause dangerous internal bleeding, which is related to chronic liver disease. Alcohol can also change the way the body secretes gastric acid, resulting in delayed gastric emptying affecting all the muscle movements of the entire bowel. The liver is where alcohol is mostly metabolized. It breaks down the alcohol into a substance called acetaldehyde, which is carcinogenic and toxic. When a person drinks heavily, cirrhosis of the liver can occur. The liver becomes scarred, hard, and nodular. It can no longer perform its job of breaking down and removing harmful substances from the body, which is a life-saving function. When this happens, the person will go into multiple organ failure. Long-term heavy drinking increases the risk of developing many different types of cancer, including cancer of the liver, mouth, voice box, throat, and esophagus. Alcoholism also has been linked to colorectal, liver, and breast cancer. Alcohol addiction is a devastating illness that shrinks the brain. Someone addicted to alcohol should never try to detox alone. It is essential to get professional help and withdrawal from alcohol safely. At Canyon Vista Recovery Center in Mesa, Arizona, professional staff will answer your questions, guide you through the withdrawal process, and provide you with the tools you need to live a life that is healthy and sober. Learn more about programs offered at Canyon Vista Recovery Center, AZ alcohol treatment facility.